BRITISH ATTACKING FORT SULLIVAN The squadron of warships that sailed into Charles Town waters was intimidating. At least 58 vessels of the world’s greatest navy faced the patriots — including two 50-gun men of war, five 28-gun frigates, a 20-gun sloop, a bomb ketch, and other vessels armed with about 290 naval guns. 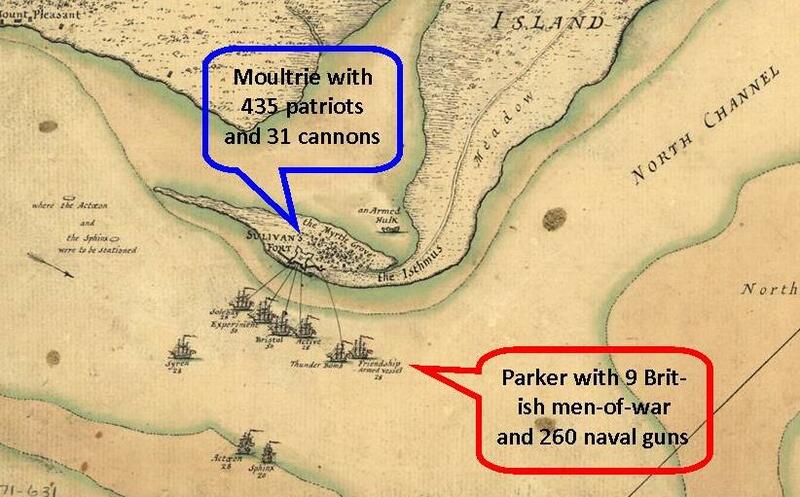 For details, see Naval Resources in Battle of Sullivan’s Island. British Commodore Peter Parker gathered his fleet outside the Charleston Bar, a series of offshore sandbars protecting the harbor. When tide and wind conditions were favorable, the ships crossed the bar and anchored in Five Fathom Hole off Morris Island until the naval attack began on June 28. PATRIOTS DEFENDING FORT SULLIVAN By June 28, the two sides of the square fort facing the enemy were essentially complete, but the other two sides were unfinished and susceptible to attack from the rear by land or water. Calling it a “slaughter pen”, General Charles Lee made plans for evacuation. He ordered construction of a floating bridge to connect the island with the mainland (Mount Pleasant) for rapid retreat when the British attack succeeded. The bridge was built, but it did not support movement of large numbers of troops. 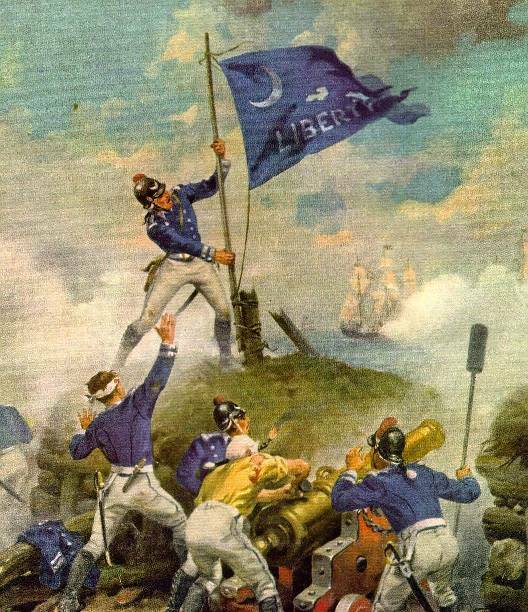 The confident Colonel William Moultrie and his 435 men had no intention of abandoning the fort. The story of their heroic defense is told at Fort Moultrie, a National Park Service site on Sullivan’s Island. I’ve been to Fort Moultrie at least 20 times and it still amazes me. Very family friendly also. It’s a great way to teach kids history, without them even realizing it.